Continuing from my last entry from last week (sorry about the delay), which left our intrepid pair standing at the tasting counter at Richard and Thekla Sanford's Alma Rosa Winery. As I mentioned before, we were welcomed like long-lost family when I dropped Ian's name, and we got to taste all the wines that would generally be saved for winery members. 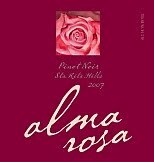 Alma Rosa focuses on the wines on which Thekla and Richard Sanford built their reputation - the cool growing varietals best suited to the Sta. Rita Hills AVA. Pinot Noir and Chardonnay grapes predominate and form the core of the Alma Rosa Winery & Vineyards product line. 2007 Pinot Noir - Sta. Rita Hills - a delicious blend of several vineyards. And on sale for a special price. 2008 Pinot Noir - Sta. Rita Hills - a delicious blend of several vineyards. Same, but different. 2007 Pinot Noir - Blend of Clone 667 + La Encantada Vineyard, Sta. Rita Hills. I have a star next to it and a big 'WOW'. $43.00 - Bought 1 bottle. 2008 Pinot Noir - Clone 667 - La Encantada Vineyard, Sta. Rita Hills - Oh. My. Big fruit, peppery finish. Delish! 2008 Pinot Noir - Clone 115 - La Encantada Vineyard, Sta. Rita Hills - Interestingly, the winemaker was Christian Roguenant who also makes Rosenthal Wines in Malibu. Another exceptionally talented 'hired gun'. I say these were the standouts, but there wasn't a bad one in the lot. We had a lovely time tasting Alma Rosa's truly artisan wines. We made our purchases and drove back through the gorgeous El Jabalí vineyard and onto the next adventure! Feeling as if we had enough time and energy for one more winery, we headed back to Buellton for Cold Heaven Cellars, home of Viognier goddess, Morgan Clendennen. Morgan was off pouring wine at a charity event, but Jonah Waldman more than made up for her absence. We had met Jonah 2 years ago when he was working for Doug Margerum. This day, while we tasted, we spoke of art and philosophy and winemaking and the interconnectedness of everything. It was pretty metaphysical, but we also laughed a lot, and took time to enjoy the delicious wines. And, of course, left with a couple of bottles of the Le Bon Climat and Sanford and Benedict vineyards. We love Morgan's wines! As we were leaving, Jonah asked for a ride over to Solvang, and we obliged him. We asked for suggestions on restaurants that wouldn't cost an arm and a leg, and he suggested the Hadsten House, which is attached to one of the hotels on the west end of town. What a great suggestion! 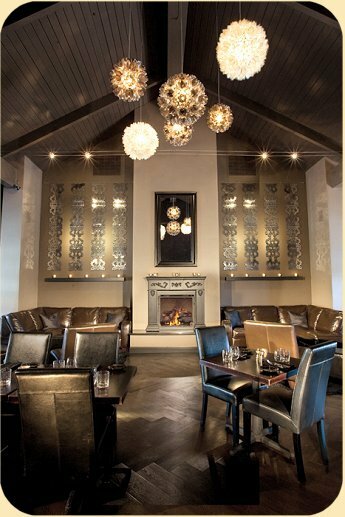 When we walked in, just before 6, they weren't quite ready for dinner seating, so we sat on comfortable couches in the bar. JD had a glass of some wonderful local wine, and I had a split of sparkling Pol Clement Blanc de Blancs. Lovely! We were seated after a few minutes, and read the interesting menu. There were more than a few items that looked interesting, and after having our meal, I know we'll eat there again to try a few more! JD ordered the lobster mac and cheese - none of that Kraft boxed stuff. This was mascarpone cheese and lobster. Did I mention lobster? OMG. I had the fresh spinach pasta strips with chicken and roasted tomato cream sauce with bacon. OMG. Perfect. We paired the meal with a bottle of 2007 Alma Rosa Pinot Noir. Corkage was only $10 - and they waived it for us although I'm not sure why. During dinner, a young couple was seated next to us. Turns out they had just arrived from New York that morning, picked up a rental car at LAX, and driven to Solvang! They were planning on taking in as much of California as they could in one week before returning to Beverly Hills for a wedding, and then going back to New York. They were already entranced with the state - especially the drive up the coast. We told them about Cambria, gave them a short list of wineries in the Santa Barbara/Santa Ynez region and wished them 'bon voyage' as it was time for us to hit the road back to Burbank. The Sunday night driving gods were with us, and remarkably, we got home in just under 2 hours! Haven't gotten thru Santa Barbara that quickly in years! It was the perfect end to a just about perfect weekend. I can hardly wait to go back!